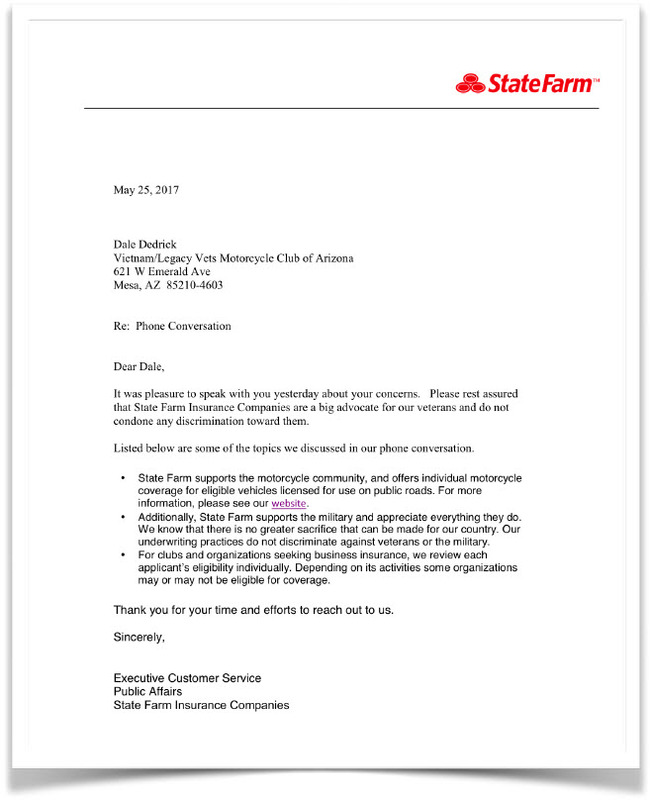 The MPP is pleased to report that the National Council of Clubs (NCOC) has successfully pressured State Farm Insurance to clarify that, as of June 19, 2017, it is no longer State Farm policy to deny coverage to “businesses engaged with motorcycle clubs.” Although decisions to insure any business, including motorcycle clubs, are made on a case by case basis, State Farm says it has no general policy to deny coverage to businesses engaged with motorcycle clubs. The NCOC approached State Farm because of a letter dated February 27, 2017 from State Farm denying coverage to a Veteran’s motorcycle club because “we don’t provide coverage for businesses engaged with motorcycle clubs.” State Farm’s original response was vague and avoided the explicit questions being asked by the NCOC, so the NCOC continued to press State Farm for clarification on its policy concerning motorcycle clubs. The June 19, 2017 response from State Farm is, with one exception, clear and concise. There is still one question that has not been clarified. The original letter dated February 27, 2017 explicitly states that “we do not provide coverage to businesses engaged with motorcycle clubs.” This statement in the February 27, 2017 letter is plainly stated and incontrovertible. Clearly, according to the June 19th response, this is not State Farm policy any longer. Did State Farm change this policy after the February 27th letter or was the February 27th letter an inaccurate statement of State Farm policy? To be clear, it is not State Farm’s policy to deny coverage to businesses engaged with motorcycle clubs. We offer a variety of business insurance options to help small businesses succeed. However, as previously stated, for clubs and organizations seeking business insurance, including motorcycle clubs, we review each applicant’s eligibility individually. Some organizations may or may not be eligible for coverage. Again, we are not able to discuss the specifics of any particular application, however, we can tell you that it is not State Farm’s policy to deny coverage to businesses engaged with motorcycle clubs. Additionally, State Farm supports the motorcycle community, and offers individual motorcycle coverage for eligible vehicles licensed for use on public roads. For more information, please see our website. We appreciate all you do along with other projects that aim to address profiling and discrimination. At State Farm, we’re committed to an inclusive environment where all our associates and customers are treated with respect and dignity, and differences are valued. The post Motorcycle Clubs Successfully Pressure State Farm to Change Policy? appeared first on Motorcycle Profiling Project. This entry was posted in Motorcycle Profiling Project on June 23, 2017 by Webmaster.